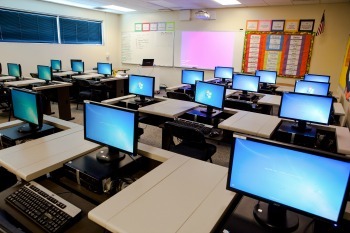 Quality Education: Is Cloud Computing The Answer? Technology is a beautiful thing. It allows us to do things we can only dream of as kids. But now that technological advancement have gone through the roof, are we really prepared to have this much technology in our lives? We already deal with so much technology use in our day to day. From school to work, we are glued to our computers or laptops for hours on end trying to get things done. Kids spend their free time watching videos on Youtube or playing with various gaming apps they have downloaded. You won’t often see kids playing outside anymore. Now, as news of quantum computing is making its round on the web, we also wonder will this technology ever reach the schools too. It may take years from now before this technology reaches the public but the experts are already using the cloud to improve the quality of education. When you think about a traditional school workflow, it’s not unlike that of a business: paper is generated and moved in a systematic way between the children and the teacher. Just as cloud computing has transformed workflows in business to make them more collaborative and mobile, that same type of change has been coming to schools. Children and teachers use the power of the cloud to collaborate while accessing, storing, and sharing content. As with business, this change is ongoing, uneven, and by no means complete. But if schools are at least partly about preparing children for the next generation of work, then the cloud needs to be a part of that preparation. Just as some businesses have struggled to transition to the cloud, schools face similar challenges. But because schools involve a specific demographic—children from a variety of abilities and socioeconomic and linguistic backgrounds—their challenges can be even more complicated. As the paper trail lessens, there is less need to cut down trees and less worry for storage space among teachers. Teachers can conveniently store and access student files and papers on the cloud that can also be easily shared among other faculty members. The students, or their parents when necessary. Not only has technology transformed the work of a teacher but the children too as homework can now be submitted online while at home or even allow students to take tests even when not in school. Students now have the option to study online if they want to. I can’t put my hands on the thing right now, but I’m pretty sure that the Parenting Manual I was issued when my kids were born deemphasized the importance of keeping up with changes in the way they do things as they grow up. The worksheets and hand-written essays of their younger years have changed into collaborative work done online as they “matured” into high-schoolers. Has it changed the work? Maybe less than it first appears. Technology may change human behavior, but it doesn’t really change human nature. Most kids don’t much like doing homework, and cloud services haven’t done a lot to change that. What’s interesting is that the kids, teachers, and administrators I talked to generally like the flexibility of using cloud-based classroom tools, but none of them think it has fundamentally changed classroom life. We can’t deny the ease and convenience offered by technology to students and teachers alike. However, it also has its drawbacks. What if the student doesn’t have a computer at home? Will his/ her grade suffer? How can parents keep track of their kid’s school work when it’s directly shared to their teachers on the drive? As far as parental involvement goes, Dahlstrom agrees with my gut feeling. “I do have the feeling that they (parents) are not as involved,” she said. “Parents used to be able to go through their kids’ bags to see the work,” which is no longer an option. In everything we do, we need to find the perfect balance so it’s a win-win solution for all. The same principle applies when dealing with technology. Although we have integrated technology into our lives for quite some time now, it can still be overwhelming at times especially when you add priorities and time constraints in the equation. Studying is hard enough and technology may or may not work for some students, so administrators and teachers should be aware of this and offer alternatives so their grades don’t suffer or it beats the purpose of getting an education after all.